I got an email from Goodreads Deals today telling me that Altered Carbon by Richard K. Morgan was on sale for $1.99. My response was was not happiness, but a rush of anger and a complaint email to GR customer service. Since I had previously opted out of these notification emails, I was not a happy camper. Granted, getting put on an email list I did not sign up for is one of my pet peeves. But a lot of my anger in this particular situation was because this is the second time that Goodreads has signed me up for a list that I did not want. The last time this happened, I also wrote an email complaining about their actions. Goodreads’ response to that email came across as uncaring – after all, as they explained, all I had to do was go into my account and change my settings. Never mind the fact that they sent me something that I did not want and had not signed up for. After the last email, I specifically went into my listings and changed all my newsletter and mailing preferences to state that I did not want these kinds of email notifications. Notice that description says “opt-in”. Now, let’s consider that phrase opt-in for a moment. Just to be clear, opt-in means that the recipient has knowingly given you, the sender, permission to communicate with them via e-mail. An easy test to determine whether or not your e-mail is opt-in is to ask yourself if the recipient will be expecting to receive e-mail from you. If so, it’s opt-in. If not, it isn’t. Was I expecting to get that email from Goodreads? Absolutely not. I had previously opted out in my email settings on my account and had even written them a complaint letter about unsolicited newsletter signups. So I had no reason to expect that I would receive this kind of an email from them and every reason to expect that I would not find something like this in my inbox. The insult-to-injury part was that I already own Altered Carbon. It is actually one of my all-time favorite books. So I wouldn’t have signed up to be notified about a book I already own. It seems pretty apparent that while Goodreads Deals may have originally been promoted as opt-in, in practice, it has evidently become opt-out. I haven’t heard back from Goodreads yet, but after the unconcern expressed the last time I dealt with them on this issue, I am not expecting much from them other than being told I can, of course, opt-out. < /sarcasm> Of course, I have done that before and we see how far that got me…. 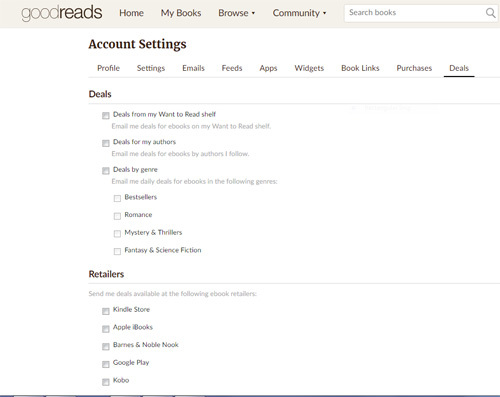 I would advise checking your Goodreads settings. And, if you don’t want to receive these kinds of emails, I suggest that you specifically opt out of the deal emails. To do so, go to Account Settings>Deals and uncheck all the boxes. Who knows? It may actually work…for a while. How about you? Have you gotten any unwelcome emails from Goodreads?